Shimmies take a lot of muscular and cardiovascular endurance! What a dancer with good endurance looks like: She can perform moderately strenuous dance moves such as traveling steps and shimmies for at least ten to twenty minutes without tiring. She isn’t always out of breath; most of the time she could talk while dancing if she wanted. She doesn’t run out of shimmy power by the end of class. She maintains good posture and alignment, even when she’s been dancing for awhile. 1.) It’s hard to hold your arms up for too long. By the end of class, you look pretty deflated and your arm position might best be described as ‘chicken wings’. Why: Your chest, shoulder, and arm muscles fatigue pretty fast if they are not regularly trained. The Fix: Don’t let arm positions and movements take a backseat during your dance practice. Try to always be doing something with your arms, even if it’s just holding them in position. Switching positions, if you can, is better than dropping armwork completely. When your arms get tired take a break, but don’t forget to re-introduce them again a few minutes later. Want to kick up your arm strength even more? Introduce a veil to your practice. You don’t even have to dance with the veil, just holding it will be enough to make arms and shoulders work really hard! 2.) You do an awesome _______ shimmy… for about thirty seconds. Then it’s gone and your body feels kind of like Jell-o when you try to shimmy again. Why: A shimmy is very localized, but still very intense, demand on your muscles. They’ll fatigue quickly when you’re just starting to learn a new movement. The Fix: Try cycling shimmies through several speeds to build muscle endurance. Start with a slow and large movement, refine to slightly smaller and faster, then return to slow and large. When you feel yourself getting tired try slowing down instead of stopping. It’s slightly less demanding for muscles, but they’re still engaged and therefore becoming stronger. 3.) Ten minutes or more or non-stop dancing to the music is certain to leave you out of breath. Why: Your cardiovascular fitness, the ability of your heart to pump oxygen to your muscles, could be improved. The Fix: You need aerobic exercise! Try to practice at least two or three times a week. Make a playlist of your favorite songs, ones that really get you pumped up, and dance without stopping for at least ten minutes. Incorporate moderately strenuous shimmies and traveling steps as often as you can. Extra-curricular study: Aerobic exercise featuring repetitive movements is perfect for working on your endurance. Other forms of dance, such as Bollywood, can be really fun additions to your routine. My favorites? Walking/hiking and step aerobics! Technically speaking, strength is the capacity of a muscle to exert force against resistance. In belly dance we don’t hold weights (although I have a pair of zills the size of tea cup saucers that might count); the ‘resistance’ is often gravity or even the weight of our own bodies. 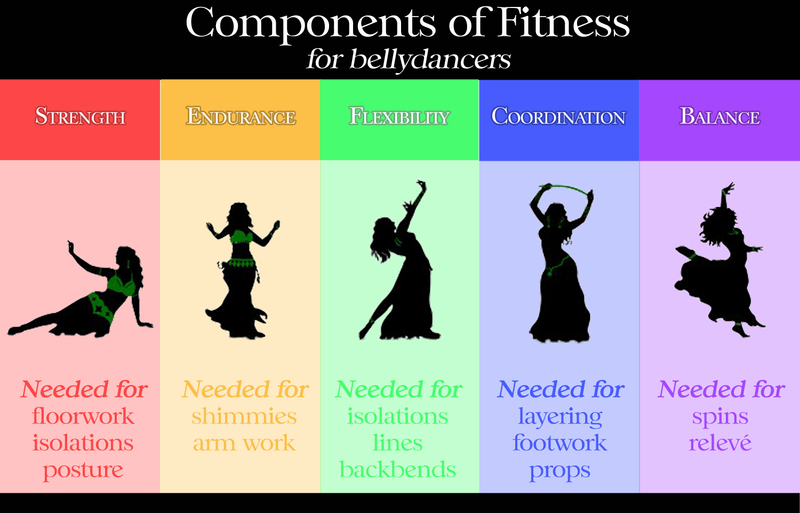 Belly dance is therefore only light strength training, but having strength is important for maintaining good posture and for clean isolations. 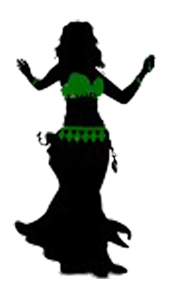 What a strong belly dancer looks like: She always has good posture and alignment. Her isolations are clearly defined and she can perform them equally well slowly or quickly. Her core muscles can support movements with a large range of motion. She can easily transition from standing to floorwork. A quick note: What’s the deal with isolations? Isolations, as I refer to them, are small, highly focused movements. These include the circles, waves, and eights of the hips, belly, torso, chest, and shoulders. Isolations are a product of coordination (your brain knowing and connecting to the right muscles at the right time), strength (those very small muscles having the power to move large sections of your body), and flexibility (those same muscles being able to stretch long enough to produce a wide range of motion). You need all three to have clean, precise isolation work. 1.) Your body seems to just deflate by the end of class. Your instructor is constantly reminding you to keep you chest lifted and your shoulders back. You experience lower back pain often while dancing, or perhaps even the next day. Why: You don’t have enough core strength to support good posture and alignment, and to compensate other muscles are stepping in to do the work where they shouldn’t. The Fix: Concentrate on good posture throughout your day, both at work and at home. Supplement your dancing with light weight training, yoga, pilates, or other core strength fitness routines (see below). 2.) You’d like to achieve greater extension with your torso movements (slides, circles, camels, back bends), but when you try to make your movements larger you feel off balance. Or, you can extend much further on one side than on the other. Why: You don’t have enough core strength to support the movement (on either or both sides). The Fix: Practice extending the movement to the point where you feel tension in the opposing muscle groups. Make sure you’ve maintained good posture and alignment. Hold in the extended position for ten seconds or until the muscle fatigues. Take a break and repeat. 3.) You’re working on an isolation that’s difficult for you. You vaguely feel like you can connect to the right muscle, but it just doesn’t seem to go anywhere when you ask it to move. It feels weak and heavy, like there’s an invisible wall preventing you from moving it. Why: The muscle group you are trying to move is not strong enough to carry the weight you’ve asked it to carry (or you’re still having trouble connecting your brain to the right muscle, a coordination issue). The Fix: The one’s the hardest to deal with, but as always practice can help. Visualize the muscle you’re trying to move, imagine it working. You might be able to place your hand on that muscle group to feel it when it contracts and releases. You might also try “isometric” (squeeze and release) contractions to help locate and strengthen. Extra-curricular study: My favorite fitness programs to better my posture and and rev up my floorwork are yoga and TRX suspension training. Light weight lifting, core and abdominal exercises, and Pilates will work, too. A physically fit person can do more than just lift weights. There are actually several components of fitness including strength, endurance, flexibility, coordination, and balance. The good news is that belly dance (at least in some small ways) can be used to target them all! Why should you care? So this is actually important! Not convinced? Okay, think of a move that you find difficult to execute. Maybe it’s a shimmy that you just can’t keep going (endurance). Maybe you have trouble getting your torso or hip movements to go where you want them (strength or flexibility). See where I’m going with this? In fact, often when we think we understand how to do a movement but our body just doesn’t seem to want to follow, it’s because we’re missing some component in our fitness. What does this mean? Well, it means if you understand this process you can practice more effectively using techniques to target that component of fitness. Essentially, you can change the way you dance to rev up your strength, to be more flexible, etc. A small disclaimer: There are often lots of reasons why we can’t successfully execute all the movements we’d like. This includes previous injuries, failure to locate the proper muscles, misunderstanding how to produce the movement, psychological resistance… the list goes on. I’m not presenting this as the silver bullet to all of your belly dance movement woes, but I have seen this theory work wonders when applied to my students. It can’t hurt to try! So stay tuned! This week we’ll be focusing more specifically on each fitness component. We’ll talk about why each is important, the ‘signs’ to recognize when you’re missing it, and techniques for it’s improvement. Fantasy Belly Dance Instructional DVD GIVEAWAY! Did you read my review of this three part series from World Dance New York? Interested in owning a copy? Here’s your chance, it’s a giveaway! I’m giving away the entire series (Magic, Desire, Mystery) to one lucky winner. All you have to do is comment on my review below. It’s that simple! Please note that I moderate comments before they appear on the page, so your comment may not appear immediately after you post. Contest closes Wednesday, February 15th at midnight. One comment/entry per household. Winner will be chosen at random using random.org, and notified with 24 hours by email. Winner has 24 hours to respond to the email, or a second winner will be chosen. Open to participants in the United States only. I will not use your email address for anything else ever. Promise! Like or comment on my Facebook post about this review and you’ll be entered into the drawing for the Fantasy Belly Dance performance DVD! (See above for contest rules). Update 2/16/12: Thank you to all that participated! The winners have been selected and mailed their DVDs. World Dance New York sent me this three part series, and I have to say I was very impressed! Each DVD of Fantasy Belly Dance features three instructors teaching their own themed choreography. Through movement selection, expression, costuming, and music they embody a character or image and tell a story through dance. For each routine there is a walk-through of the choreography and a full theatrical performance. The quality of the instruction and content. These are top level dancers who are teaching routines using the techniques for which they are best known. The choreographies are well done, and they don’t look like ‘DVD choreography’. They use real music, too, and not ‘DVD music’. There’s also a lot of content on each disk. There is a diversity of styles including cabaret, tribal, and fusion. Different dancers choose to embrace their theme to different degrees, so some routines are suitable for a traditional performance while others might best be saved for alternative venues or themed shows. Some routines include props (sword, zills, veil, wings of isis), but not all. There are bonus features for every instructor’s section. In addition to the choreography breakdown and performance, the dancers include a discussion on their philosophy for their particular piece. Some sections have tips for how to handle props, proper body conditioning, or even how to set up a sacred dancing space using an altar! It was neat to be able to listen to how each dancer approaches the art. The DVD production values are very good. The lighting and videography are appropriate, and it’s easy to find what you need through the DVD menus. The description on the back of the box says that these routines are for intermediate or advanced dancers, and they aren’t kidding! While they do break down and walk through each choreography, there is generally no instruction on how to do each particular move. You should know your circles, shimmies, and eights before attempting. Mystery features Neon as a serpent in a cabaret fusion piece, Sera as shadow in Gothic tribal fusion, and Ayshe as a phoenix using the wings of Isis. Desire features Naraya in a tribal fusion piece embodying Salome, Blanca as a lovelorn nymph using traditional cabaret and veil, and Darshan as a ritual priestess using tribal fusion and veil. Magic includes a section by Autumn Ward as an enchantress, Isidora Bushkovski the warrior princess using sword (with great bonus features! ), and Ariellah as the goddess Kali in a tribal fusion piece. To summarize, this is a great resource for dancers who are looking to add a little something different to their repertoire. I would also highly recommend it to intermediate level students who are learning to develop their own style or learning how to express themselves through their performances.